Before you start recording, you need do some configurations. 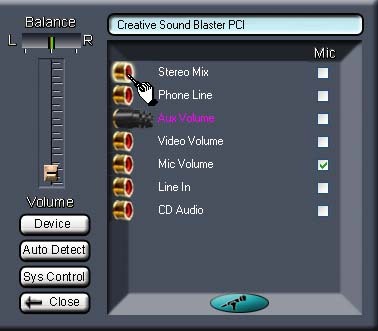 3D MP3 Sound Recorder G2 has some default setting, such as default wav file settings, output file name and location, default file format etc. However you need to select a correct audio line depends on your recording tasks. 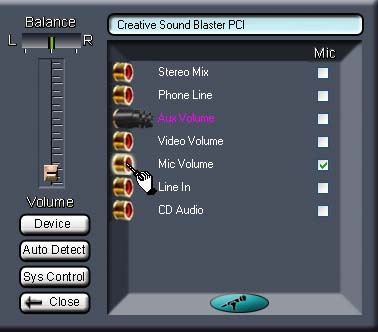 To Select an audio line , you just need to click the line configuration button (on the right side) to open the audio line configuration window. If you cannot see some recording devices, it probably being disabled by the system, so you may need to enable them. Start -> Control Panel->Hardward and Sound->Manage audio devices. Chose the option to "Show Disabled Devices", it will show all disabled devices, enable them and you will be able use these devices. Usually the audio line for streaming audio recording has the name of Stereo Mix or Wave out . but it's name may be different for different sound card. Click the "Auto Detect" button and the program will test each line. If an audio line suitable for playback recording is found, you will see the message on the screen. If not found, you need to do manual configuration. 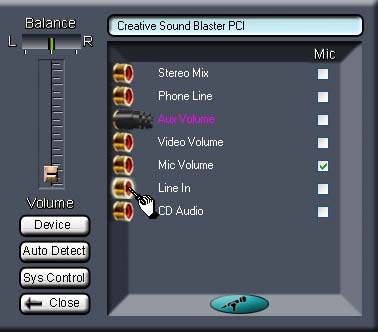 Configure audio line for playback recording manually . If a audio line suitable for playback recording is not found by automatic configuration, you need to test each line manually. Turn on your speaker, close all media players. Click on the first socket, the first socket will be lighted , and at the same time you will hear the sound "Line one" ,wait until the green ring disappear . if you can hear the echo of sound "Line One" , then click on the red button to close this window. Otherwise you need to test other lines.. If you can not hear the echo when you click on the first socket, then click on other sockets. When you hear the echo sound of "Line x", where x is the number of the line, that means this line can be used for playback recording. B ) Open other media player to play audio. C ) Click the record button to start recording. Connect the microphone to the microphone jack of the sound card. 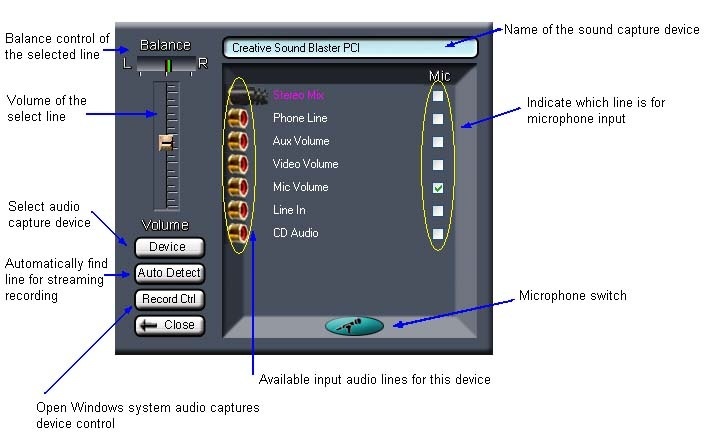 B ) Activate the audio line of microphone. D ) Click the record button to start recording. B ) Activate the audio line of Line In.